This article is Part II of my report on the eating habits of 141 triathletes and marathoners I surveyed in the Fall 2008 during my first year of graduate school in applied cultural anthropology. At that time I was still new to the various theoretical perspectives in anthropology that strive to explain why people do what they do. Like any interpretation of behavior, my survey results are contextual of a particular place and time with biases per the questions I asked and the perspectives of my respondents. That being said, I still find that trying to figure out “why people do what they do” is not only interesting, but has obvious practical implications. From altruistic societal goals such as creating more effective and long-lasting peace initiatives and changing consumer behavior to more environmentally sustainable norms and to more mundane things such as marketing a local business, figuring out why people do what they do is many practical applications. My initial interest in the sport sub-cultures of triathlon and marathon running came from participating in both sports when I was younger and watching both cultures evolve from serving smaller groups of “core” participants and mostly elite athletes and become more conventionalized and commoditized with participation mass-marketed to anyone with the time and money who wants to look like an “Ironman” or lose weight. The eating habits of my sample of triathletes and marathon runners generally followed the working and break hours of an 8-to-5 office culture with the demands of training one to two workouts a day. Food consumed during the day was usually taken as regular snacks or a quick meal in between working and working out until the, generally, larger and main evening meal. Or, in other words, eating food was less about the sensual (as in tasting, smelling, etc.) and social bonding aspects of a communal meal and more about the utility of food to serve as a fuel. What follows is what my respondents said via their survey answers about what they ate, when they eat (lunch was rarely at noon), and how much they ate. Finally, I end this report with a symbolic interpretation of the survey results about what consists of a “perfect” meal according my surveyed triathletes or marathoners. I surveyed 108 marathon and ultra runners of two local running clubs and 33 triathlete members of a local triathlon club using SurveyMonkey.com to record and analyze athlete responses. In addition to the online surveys, I interviewed several race participants about their food ways at the Carpinteria Triathlon, September 28, 2008 and Santa Clarita Half-Marathon and Marathon races, November 2, 2008. Details on demographic composition of the survey sample will follow in Part III. My sample of respondents was purely convenience based. However, they represent “typical” triathletes and marathon runners per the demographic information from online media kits for Triathlete and Runner’s World magazines (Triathlete 2008; Runners World 2008). And, full disclosure, they were also my friends and friends of friends who self-reported their eating habits. Their self-reported food intake may not be totally accurate but was about their most recent period training for and during their last triathlon or marathon. Each of the triathletes I interviewed told me that he or she usually ate alone during the day and shared a meal with others only in the evening. Eating alone can connote ascetic values, spiritual purity and a social separation from others according to anthropologists (Goody 1982 ). Eating alone rather than with others also reflects the dominant individualist mores in America where the nuclear familial household is the most common kind (Triandis 1995). And, like people who live in other industrialized or urban communities, there is trend towards de-socialized eating habits as snacking has replaced sit-down meals by people who demand convenience due to their busy work schedules and the availability of prepared foods, packaged snacks and “fast” food (Mintz 1985). Sharing a meal with others is symbolic of social ties and is often practiced ritualistically before an important race (in the form of a “Pre-Race Pasta” or “Carbo Loading” dinner) by long-distance triathletes or marathon runners and after a race (such as an organized awards dinner such as at an Ironman Triathlon or at an informal celebratory meal among friends who raced together). The commensality of these meals enforces the social bonds within the group of athletes and friends as they experience a spirit of communitas (a feeling of egalitarianism and connection) with each before a race and celebrating afterwards (Giulanotti 2005:6). The triathletes and marathon runners I surveyed spaced their meals and food intake around their daily and weekly workouts (Appendix A:12, 13; Appendix B: 12, 13). Many of them reported the foods they have had to “give up” in order to live what French anthropologist Pierre Bourdieu terms the “ascetic exaltation of sobriety and controlled diet” of an upper-middle class lifestyle (Bourdieu 1984: 213). Living a disciplined and ascetic lifestyle and stoically enduring physically arduous endurance training and racing gives legitimacy to their membership within the triathlon community (Atkinson 2008). Surveyed triathletes and marathon runners generally eat according to their daily training schedule and the professional 8 am to 5 pm work hours (Appendix A: 18, 19; Appendix B: 18, 19). 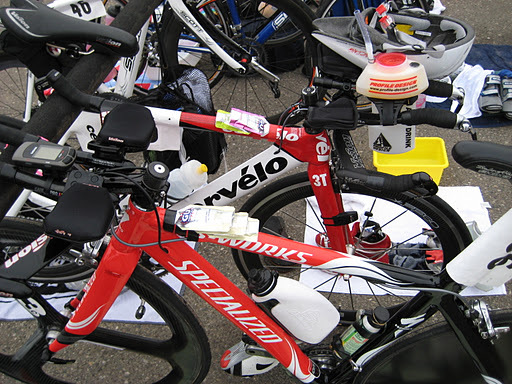 The eating times of triathletes often reflected their multiple daily workouts (Appendix A: 12). About 81% of surveyed marathon and ultra runners ate more often than three times a day (Appendix B: 18). Triathletes seem to eat more often with 92% of surveyed triathletes claiming that they ate more often than three times a day (Appendix A: 18). “Sports nutrition is a practice as much as a science,” according to Sports Nutrition: Handbook of Sports Medicine and Science (Maughan 2002:140). Triathletes and marathon runners are exhorted by sports nutritionists to eat the same foods as they normally do (in the evening and morning before a race or long workout) before an important race so as to not jeopardize their race outcome (Ryan 2007). Both the triathletes and marathon runners I interviewed and surveyed commonly practice eating these foods as one of their “pre-race rituals” (Appendix A: 23, 24; Appendix B: 23, 24). The traditional British meal, made up of a meat dish plus two side dishes, preferably one a vegetable and the other a starch. The British meal has influenced much of the dominant American food culture according to Anthropologist Mary Douglas (Douglas 1975). According to Douglas, the proper British meal includes an entrée of meat (A) that is accompanied by two side dishes (2B): one that is a starch and the other that is a vegetable. Douglas encodes this meal structure as A+2B (Douglas 1975). Triathletes and marathon runners seem to have their own “proper meal” structure that is based on the different proportions of macronutrients (protein, carbohydrates, fats) and includes carbohydrates of some form (Appendix A: 23; Appendix B: 23). The macronutrient proportions are different if the meal is consumed before a workout (or race) or after. Hence, according to my surveyed respondents their “perfect” meal could be generally denoted by this formula: CHO+xMacro. The letters “CHO” is the sports nutrition chemistry denotation for carbohydrate (Maughan 2002). The denotation ”xMacro” is my own endurance athlete denotation that stands for “x” times the proportions of macronutrients (“Macro”) (USDA 2008). According to endurance athlete sports nutritionists, a good meal for a triathlete or marathoner can be either in a solid or beverage form but it must include carbohydrates (Applegate 2008; Fitzpatrick 2006, Ryan 2007). It’s interesting that the surveyed triathletes and marathoners categorized food by their macronutrient type and the food’s perceived functional attributes to create a physically fit athlete. These functions were perceived to be based on the current sports nutrition and scientific research on exercise physiology in both these sport sub-cultures as well as in the mainstream the health and fitness trend in American culture. Unlike abstaining from eating pork or eating turkey on Thanksgiving, these food habits are perceived to be based on nutrition science (and even use scientific terminology) rather than on religious identity or national or ethnic traditions. My next post about eating habits of triathletes and marathoners will explore some cultural reasons why they eat this way according to interpretive anthropological theory. The working title for Part III of this series will be something like Part III: “Food As Fuel: Why Triathletes and Marathoners Eat So Weird Compared to Non-endurance athletes”. Or, something like that. In the meantime, bon appetit and happy training! Note: I do not benefit from mentioning any products or brand names mentioned in this post. 2008 “Triathlon Suffering and Exciting Significance,” Leisure Studies, April, Vol. 27, No.2, pp.165-180. Burke, Louise M., Gregoire Millet and Mark A. Tarnopolsky. 2007 “Nutrition for distance events, “ Journal of Sports Sciences, Dec. 15, 25, Vol. 18, no. 3, pp. 281-300. 2006 Performance Nutrition for Runners, Boston, MA: Rodale Press, pp. 1-151. 2008 “Sports Nutrition: Energy Metabolism and Exercise,” JAMA: Journal of the American Medical Association, [J. Am. Med. Assoc.]. Vol. 299, no. 19, pp. 2330-2331. 2002 Sports Nutrition: Handbook of Sports Medicine and Science, Malden, MA: Blackwell Science, Inc.
1985 Sweetness and Power: The Place of Sugar in Modern History, New York, NY: Penguin Books. 1993 Religion and Sport: The Meeting of Sacred and Profane, Westport, CT: Greenwood Press. 2007 Sports Nutrition For Endurance Athletes, Boulder, CO: Velo Press. 1995 Individualism and Collectivism, Boulder, CO: Westview Press, pp. 14-80. 1964 Betwixt and Between: The Liminal Period in Rites de Passage. In Magic Witchcraft and Religion: An Anthropological Study of the Supernatural, Seventh Edition, Pamela A. Moro, Arthur C. Lehmann, James E. Myers, eds. Pps: 91-100. New York, NY: McGraw Hill. This entry was posted in Biological Anthropology, Cultural Anthropology, Diet, endurance sports, Food & Nutrition, Ironman Triathletes, marathon foods, Marathon Runners, multisports, Online Surveys, Participant Observation, post-race binging, Public Health & Nutrition, racing, Research Tools, Robert M Sapolsky, runners, Running, Sport Culture, Sports, triathletes, Triathlon Foods, USA by arkirwin. Bookmark the permalink.